A couple weeks ago, I drove nearly 100 miles in one day, through a barrage of powerful thunderstorms, for doughnuts. I made that journey because doughnuts are having a moment, and I was on a mission to find the best one. In recent years, new, independently owned doughnut shops have been popping up all over the country. As a result, there are more high-quality alternatives to Dunkin’ Donuts and Krispy Kreme than ever. And these aren’t your average hunks of fried and frosted dough. Thanks to the modern doughnut revival, we have access to a spectacular range of styles and flavors, such as Bon Glaze’s cotton candy doughnut topped with a towering pouf of candy floss or Sublime’s bold salt and vinegar creation or Donut Theory’s Bam Bam chocolate frosted doughnut sprinkled with Cocoa Pebbles. In Atlanta, most of the doughnut magic is happening in the ‘burbs. Our initial research turned up more than 15 mom and pop shops slingin’ doughnuts outside the perimeter, which is roughly five times the amount we found inside I-285. With so many options luring us to far-flung corners of the metro area, we — CL dining critic Jennifer Zyman, longtime CL food contributor Brad Kaplan, and I — started to wonder which doughnut pilgrimages were worth the time and gas money. To be considered for this year’s Smackdown competition, a shop had to be locally owned and dedicated to making doughnuts. We conducted research and asked our readers, friends, and colleagues for suggestions. We couldn’t include all the shops out there, so instead we aimed to assemble a roster that represented the variety of doughnuts Atlanta has to offer. Once we had our list of 12 (including the reader-selected Doughnut Dollies in Marietta), we asked each shop to nominate a signature doughnut for the competition. Full disclosure: Three shops declined our nomination request. In those cases, we asked the on-duty employee to identify the shop’s bestseller and entered those into the competition instead. 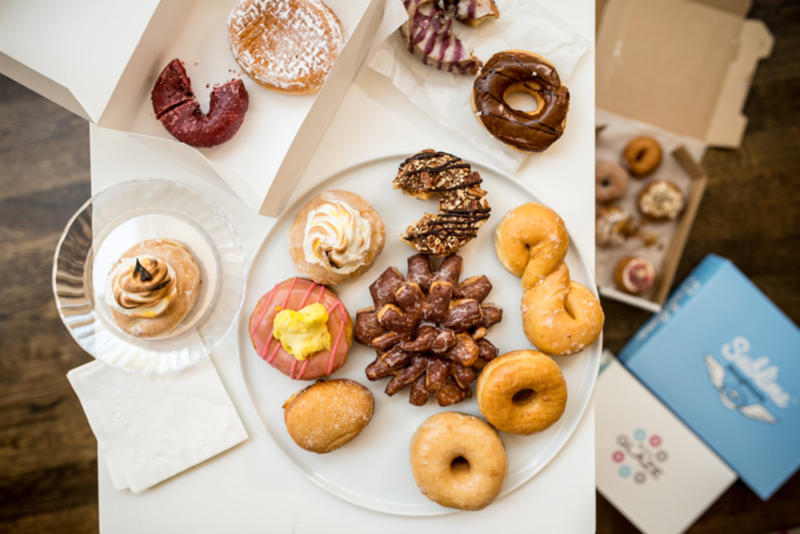 We evaluated each doughnut on a 15-point scale, accounting for three equally weighted categories: Flavor, Texture, and Overall Execution. The final scores reflect the total points out of 45 awarded by all three judges. Flavor was the most straightforward category, and we tried not to overthink it. Was the doughnut delicious, yes or no? The texture category focused on evaluating technique based on doughnut style: Were the yeast doughnuts chewy and airy or too dense and bready? Were the cake varieties tender and moist like a good muffin or crumbly and dry? The most subjective category, Overall Execution, accounted for intangibles. Did the doughnut work conceptually? Were the flavors of dough and toppings complementary and balanced, or did one clearly outshine the other? After that first taste, did we feel compelled to take another bite? After all of our research, we found our Doughnut Smackdown champion and the answer to our initial question in the process. Sometimes a doughnut is worth the drive. SD: This is either going to be very excellent or very not excellent. It looks a little lumpy and misshapen. It’s definitely not going to be winning any beauty pageants. BK: It’s got a bad banana bread characteristic. BK: It’s yeasty, bready. Wrinkly. It’s got some shrinkage going on down there. SD: It’s like a fritter that you put it in a to-go box when it was still hot and then left it in your car and then went to a movie…and then woke up the next morning and then went back to you car and then ate it. JZ: Exactly. Maybe it’s the flour? SD: I’m told they use coconut flour. BK: Hmm, wow. I don’t pick any of that up. OK, so it’s lemon blueberry? I get practically no lemon or blueberry. SD: This is a good-looking doughnut. BK: In my mind, it’s the way a Boston creme doughnut is supposed to look. JZ: Look at those layers. BK: The guy said that they use a “brioche-style” dough. SD: It looks like a Golden Layers biscuit. I guess that’s the brioche-ness he was talking about? But there’s not a buttery flavor to it. What makes this like brioche? JZ: It is extremely dense and not at all a pleasure to eat. SD: Whhhyyyyy!? How is this not good? JZ: The texture is off-putting and the chocolate frosting tastes very generic. Cloying. SD: The back of my throat stings. It’s kind of a practical joke. BK: It’s a very light cake doughnut. Almost miniature. JZ: I can’t. No. A doughnut should be like a guilty pleasure, an indulgence. SD: Yeah, it has to be worth the calories. Has to. JZ: And that’s not worth it to me. It’s like bad apple pie. It reminds me too much of a Hostess doughnut that comes in a sleeve. It’s got some greasiness. SD: It’s sweet. Like sting-the-back-of-your-throat sweet. BK: It’s kind of sticky. It’s boring. !! !What’s the craziest thing you’d do for a dozen free doughnuts? BK: It has a lot of that retro red gel around the strawberries. Like a mom’s cheesecake. SD: Like your mom’s cheesecake? BK: OK, my mom’s cheesecake. It’s like the retro gel that comes in a jar. JZ: The strawberries look nice though. Generous with the strawberries. SD: It is a little odd, though, don’t you think? To have these beautiful summer strawberries drowning in artificial-tasting gel. BK: OK, it’s cheesecake. So that’s a cream cheese frosting? SD: It’s really gloppy and the frosting doesn’t have much flavor. The gooey interior completely overpowers the plain-tasting dough. BK: So this doesn’t have any cream in it. It’s just peaches inside? JZ: I guess it’s just macerated peaches with sugar. SD: There’s very little peach. BK: There’s nothing I like about that. Not anything. SD: The dough almost tastes like Wonder Bread. BK: It is very Wonder Bread-ish. JZ: I just don’t understand why people like Revolution Doughnuts so much. Their dough is just so incredibly dense. SD: I will say, though, I love Revolution’s blueberry yeast doughnut. It tastes like eating fresh blueberries on toast to me. And their coconut cake doughnut, it’s pretty wonderful. !! !Would you rather eat a doughnut that you found on the ground at the Five Points MARTA station or a doughnut that mysteriously popped out of baggage claim at Hartsfield-Jackson International Airport? BK: They went and shoved some cream in it and called it a day. JZ: What did you just say? JZ: Wow. What is happening? SD: Oh, boy. Hello, sweetness. BK: It’s definitely the sweetest we’ve tried. The maple frosting isn’t bad. SD: It’s nice though, texturally. Kinda chewy, kinda melty. JZ: So sweet. It’s not cream in there. It’s frosting. SD: It’s hard to get around the fact that so much sugary sweetness is overwhelming the dough. SD: Where are the strawberries? JZ: The thing I don’t like about this doughnut is that the confectioner’s sugar, which tastes super over-processed, is the first taste that you get before you get to the freshness of the strawberry and the cream inside. It really kills this doughnut for me. BK: I’m not a fan of that cream. It actively turns me off. JZ: I don’t like it at all. SD: If I were blind tasting this, I would guess it came from Publix or Kroger. It’s just unremarkable and there’s a chemical quality to it. SD: The guy at the counter said this was his favorite and one of the bestsellers. Apparently their maple bacon is up there, too. BK: This is a very solid cake doughnut. The flavor of the dough is developed rather than being bland. JZ: It has the nice sugary glaze that melts away when you bite into it. It’s moist. SD: I mean, there’s not all that much to say about this doughnut. It’s a good doughnut. But it doesn’t have a wow-factor. BK: True. But it is solid. JZ: But it’s not destination-worthy. SD: Jeez Louise. This thing is heavy. BK: It does appear to be dense. JZ: The texture is actually quite nice. The crisp contrast outside and the moist interior. I’d enjoy this with my coffee in the morning. SD: It’s kinda spongey. I’m not a fan of how underdone the dough is in the center. BK: I’m with Jen. I like the chewy, buttery exterior and the soft interior. It’s pretty close to a textbook fritter. Wait, there are chunks of something in there. !! !What is your earliest or most vivid doughnut memory? The largest doughnut ever made was an American-style jelly doughnut weighing 1.7 tons, which was 16 feet in diameter and 16 inches high in the center. BK: There’s a little bit of caramelization on the top like a crème brûlée. JZ: You do get the crackle of the crème brûlée. SD: Haha. Your voice just went up like two octaves. JZ: It is good. The dough is not as tender as it could be. So after you get to the cream, which is super soft, and the crackle of the crust, I really want something that’s a little softer to give way. SD: This cream is ideal, though. BK: The cream is awesome. Almost custardy. And the texture of the top works really nicely with it. JZ: But the doughnut itself is too tough. BK: Eh, I’m with you. It works as a doughnut, but the dough itself is a little heavy. SD: ...before we destroyed it. BK: Yum. It’s definitely sweet, but I dig it. I think it would go really well with coffee. JZ: It’s a dessert donut. SD: Obvi. It’s lemon meringue pie. Damn. I just said obvi out loud. BK: I think the texture is really nice. It’s light enough that it doesn’t overwhelm. JZ: And it’s not too sweet like you would expect it to be. BK: Well, it is sweet. JZ: But not too sweet. SD: They did a great job of finding balance between the flavors and textures. 5860 Jimmy Carter Blvd., Suite 155, Norcross. 770-409-9020. www.facebook.com/SarahDonuts. BK: I hesitate to call this a doughnut. JZ: But it’s so pretty. It’s layered. BK: Looks like one big one on the bottom and then another one smashed on top of it. It smells great. JZ: That is a good doughnut. Sarah is good. SD: It’s so much lighter than you would think given how heavy it feels, which is like a grapefruit. I expected it to be very dense, but it isn’t at all. JZ: It’s gorgeous too, like a piece of art. SD: It reminds me of something...like the flavor of a churro maybe? No. Jeez. What is that? BK: It’s a little bit heavy. The bottom layer is heavier than the top layer, I think. But it’s not too sweet. It’s a good balance between the cinnamon and sugar and the dough. Plus, I could smell this all day. JZ: It’s like a really tasty cinnamon bun. BK: I think this might be my favorite thing. SD: Oh, I know what it reminds me of. Baklava!? Right? The Sunflower is the jam. All the proportions are perfect. I would drive to Norcross for that. 1) After kneading, rolling, and cutting the dough, baker Daniel Park sprinkles layers of cinnamon and sugar. 2) The dough gets rolled into a spiral, and the edges are pressed so that they do not come undone. 3) After cutting the roll into equal sections, Daniel begins cutting the dough into the sunflower shape. 4) By cutting just the tops of the roll, the inner layers of cinnamon and sugar are exposed while remaining intact at the base. 5) Once the donuts proof, they are ready to go into the fryer. 6) Daniel flips the donuts and coats them evenly with oil until they are thoroughly cooked.